It takes a sense of humour to be a tech diver sometimes, today was one of those days. We were diving the Hygia to use up some left over Trimix from a dive we had planned on the Alert that wasn’t very successful. So when we get to the bottom of the shot line and find nothing but sand the joy of an early start was starting to wear off :). However, as often is the case, we are able to make the most of the situation, it turned out to be a most enjoyable dive. 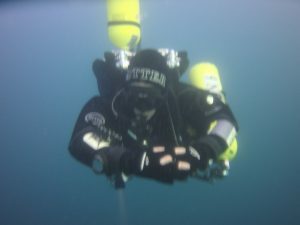 With each diver able to use the dive to hone their skills in different ways. We have the Auriga booked for next week – hopefully we can get 1 out of 3!